Just went out to feed my dog and it's just awful awful awful this morning. (I've been enjoying the nice cool mornings with a cup of tea outside, but no more). I feel sick and depressed at the thought of going out now! Mind you none of my doors or windows are particularly well fitting so I guess it's an illusion to think I'm any better off inside. My dog won't even go outside today! She seems to know that City Hall just passed 240 micrograms per cubic meter of PM10 particles, or TWICE the dangerous limit. It is rather bad today. Where's Doi Suthep gone? Was there yday!! visibility this morning March 1st. Doi Suthep is in the opposite direction, and cannot be seen anyway. I, mostly out of curiosity, check the pm2.5 reading of my DC1700 particle counter in the evening. Then I decide whether to switch on the air purifier or not, and at what level; medium or max level. Then, being curious, I check things again in the morning, after the air purifier has run all night. Been doing this since the middle of January. For reference, the Dylos Corp. has this printed on the DC1700, referring to the number (not the mass) of pm2.5 particles reported. There is no good mapping to the standard, mass-based, pm2.5 metric as far as I know, but the above are Dylos Corp's guidelines (not sure what they are based on). Anyway, up until 3-4 weeks ago, the pm2.5 reading had been around 2,000-3,000 most of the time. Sometimes down to around 1,000 also. That's the level it is at much of the year I think, though I have not really attempted to verify that. So I have not bothered running the air purifiers at that time. Then the pm2.5 count started to raise, and most of this month I think it has been around 4-7,000 in the evening, before I switch on the air purifier. So I've been running the air purifier at medium power most of the nights this month, increasing to the max when the reading was above 6-7,000. There's been some days where it has been close to 10,000. Medium power on my air purifier (Blueair 650E) brings the pm2.5 reading down from 6-7,000 to around 2-3,000. Not great, according to Dylos Corp's guidelines, but in honesty, I am not sure how applicable they are. If I remember, I will try to bring the DC1700 with me next time I leave for work, which it currently looks like will be to one of the supposedly cleanest countries (pollution-wise) in the world, to see what the DC1700 reports there. If the pm2.5 reading is much higher than 6-7,000 the evening before, I need to run the air purifier at max power to bring the pm2.5 reading in the room down to 2-3,000. 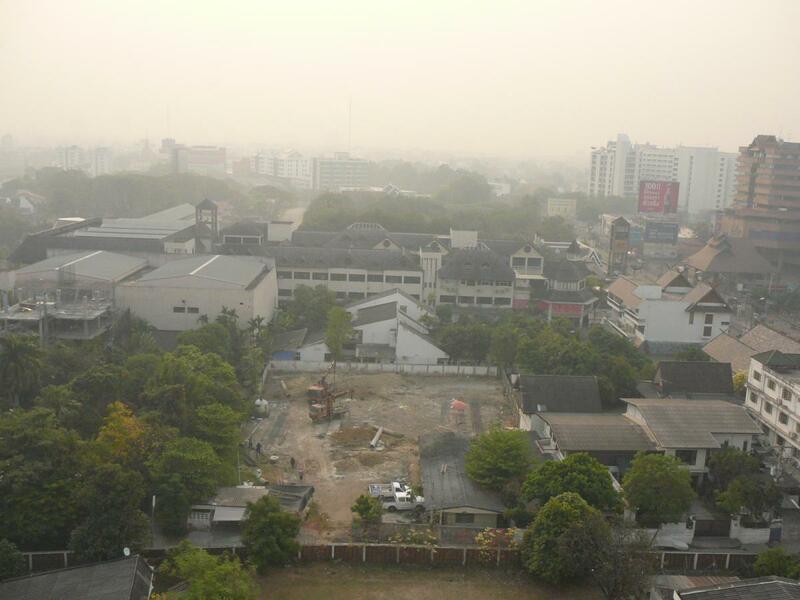 If run at max power, most of the time, the pm2.5 reading will then be around 1,000 in the morning. But max power generates a lot of noise. Last night I came home late (Friday night, you know). Mrs. Awk had switched on the air purifier at medium power, and I out of curiosity checked the pm2.5 reading before going to bed. I saw that it was around 6-7000, and since the air purifier was running at medium power, I switched it up to max power, waking up Mrs. Awk in the process. When I woke up this morning, after running the purifier at max power all night I however saw that the pm2.5 reading was still around 5,000. I thought this was quite strange. I walked around checking if Mrs. Awk had for some reason opened a window or or two, but no. Then I thought maybe I had placed the air purifier at a somewhat stupid location, close to the wall (to reduce the chance of baby-Awk running into it). So I moved it to the middle of the room, and checked the pm2.5 reading again after an hour. Nope, still around 5,000. Then I took my dc1700 outside the room. Outside the room, the pm2.5 reading was almost 20,000, perhaps even above that for some periods. Indeed, it does appear that it, whatever it is, it has arrived. Thanks for posting this info, and it confirms my fears that CM air quality is poor year round (PM 2.5 1000 is your estimate). Every time I leave, I notice the cleaner air, no matter where I go. Just a gentle reminder what is to expect for the coming weeks and month for the once who are still uncertain but able to leave. You won't see this kind of readings and news this year due to the "happy Thailand promotion" but be sure it is same same as every year. Oh I have a flight to catch for all others .. Good luck back in May. Did a bike ride on Feb.27 and was astonished NOT to see Doi Chang Dao from the highway...now that is a serious smoke-screen! I don't believe anything is confirmed! I think it is inadvisable to take one persons home grown attempt at air quality measurement as conclusive fact in this matter. certainly it may serve as an input but it is far far away from confirmed fact. Whilst it is appropriate to be concerned about air quality, it is easy to become compulsive/obsessive about the subject which is somewhat at odds with a continued presence here, especially for those with young families. Simply, if a person is so convinced of the extreme levels of pollution here, they must move, especially those with young children. For my part I have watched and participated in debates on this subject, as have many other posters, for the past ten years. Is it really that bad, is it not, is the pollution imported from neighboring countries or is it home grown, by farmers or by drivers, what is the role of the inversion layer and so on. My take on it all is that the NASA firemaps are the second best indicator of whether or not there is a problem, the first being my nose and eyes. Certainly during March and April there is a pollution problem caused primarily by burning, but to suggest it is a year round problem is a step too far in my book. I noticed the ug/m3 readings have a daily cycle, except today unusually high most of the day. AQI is much smoother because it averages over 24 hours, so this detail is missed. 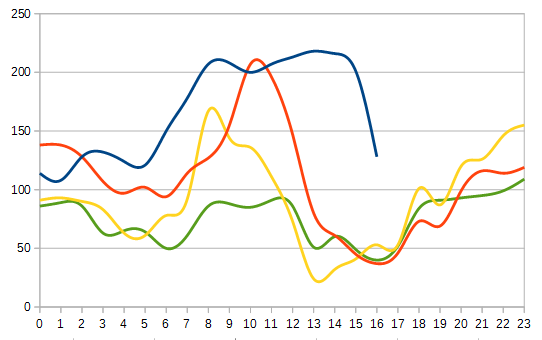 Here's a graph of the past few days, so it seems the best time to get stuff done outside is around 12pm-7pm. The readings come in an hour or two delayed so this info isn't available real time. I'm assuming unscientifically that inside the house is safer, just seems much fresher air inside. The bottom axis is time. for all the poor visibility, which i noticed today also... i am missing the smell of smoke. 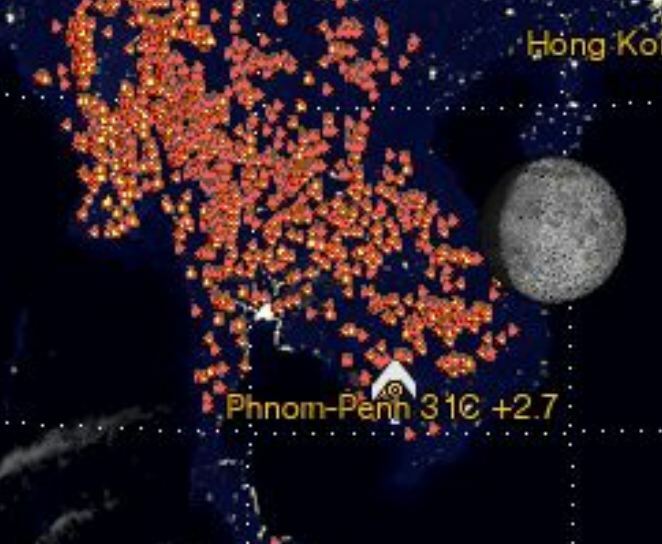 a previous poster mentioned that on the NASA maps, it showed few fires and that is what my nose tells me too. Just a few seconds outside the house left my eyes stinging. Doesn't smell of smoke, but smells of something. Not the air I would want to spend any time outside in. As for exercising or working in the garden, forget it. Oh, no no no. Please read again what I said carefully. The pm2.5 number I mention of 1000 is not the microgram/m^3 that is used in most other places, but the number of particles the Dylos reported. It has no direct relation to the health standards for pm2.5 and represents something very different. 1000, if reported by the Dylos device, is "good air". - There are about 30% fewer particles with the a size above pm2.5 inside, compared to outside. I.e., as far as pm10 is concerned, it is quite a bit better to be inside. - There is no significant differences between inside and outside for particles smaller than pm2.5. Unfortunately, pm2.5 is, most now seem to think, the main hazard, and being inside does not help. What does help is running an AC, with or without 3M Filtrete, or better, an air purifier. Best: AC and air purifier. One can note that they modified the unit a little for their purpose, partly to better evaluate the accuracy I think, but as far as I can tell, the modifications are not relevant to this discussion. Anyway, anyone with half a brain can easily google for the Dylos monitor himself and see that it is by most accounts a quality device that has been used many places by people who, unlike me, are in the business.